Charles Sainton was one of the leading exponents of silver point etching in the 19th Century. His work was very detailed and his family background in music meant that he was well connected in society, taking much of his inspiration from the leisure pursuits of the middle and upper classes. 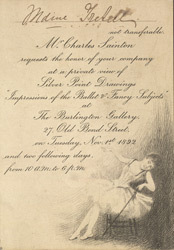 The exhibition in the Burlington Gallery advertised here featured his studies of ballet dancers. The recipient's name, Mdme Tredell, has been written in at the top of the ticket.